Enjoy the Aurelio Salon hair design and styling experience for men with the different services we offer in Howell New Jersey. 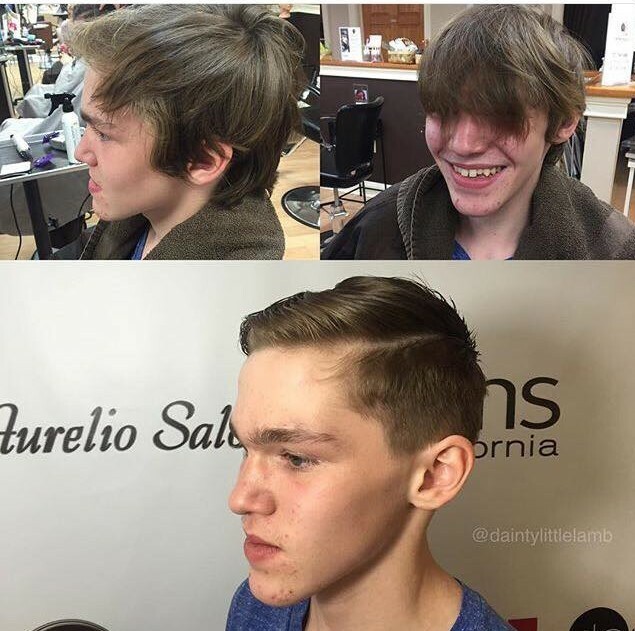 Our stylists have been trained in the latest industry men’s haircuts and frequently visit conferences on KMS California Men’s Hair Products and Mitch by Paul Mitchell. The most popular cut we offer is an express cut for him where you can get a hair experience by one of our professional certified hair stylists. Aurelio Salon’s grooming experience for him, starts off with a unforgettable shampoo and scalp message with a hot towel covering your scalp at the end. Then you get a designer cut followed with a second shampoo and conditioning treatment with great styling to finish the job. Need a quick trim? Beard looking shaggy? Get a quick detail, where we trim your eyebrows, beard, mustache, and or side burns. It’s the little things that count or what they all stare at! Hey Guy’s need to get ready for a wedding? We offer a grooms design package where we get you ready for the big day. Do you want to take the chance of screwing up your look for the big day? They will never let you forget it! Remember you you will be in as many pictures as your bride. We take the worry out of it and make you look your best. Aurelio Salon and Spa also offers custom men’s haircuts and men’s perms. If it is a little bit of wave in your hair or a lot of curls that you want we can do it for you. We also offer straighteners for men where we can soften your curls with an anti-curl or take out a curl with a relaxer. Want to get rid of that grey? 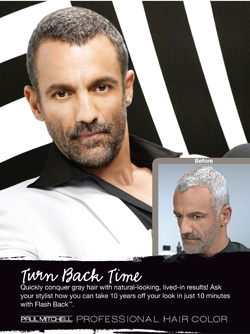 Man up to hair color, in just 10 minutes get a quick, natural-looking color tune-up or get a complete color change, MEN ReSHADE GREY BLENDING by Goldwell Professional; Color, The Most Masculine Way To Reduce Grey offers an option to meet the needs of any modern man. We have color just for guys! Men do not have to worry about getting color at the salon. It is quick and discreet! We apply the color at the shampoo bowl. It ONLY TAKES 5 minute application You really do not need an appointment if the hair color tough up is all your doing. The best part to all of it is there is no artificially colored look. The results will not fade off tone over time. Aurelio Salon has a classic kids haircut for children, 12 years old and under. The haircut can come with or without Hot Finish. This makes your young man look great for parties and pictures. Learn more about the menu of services we offer at Aurelio Salon to customers including information about the hair styling services we offer to women. See what’s new at Aurelio Salon including events and rewards customer can receive. Gift the gift of beauty with one of our gift cards available in any denomination. Call Aurelio Salon in Howell at 732-303-0052 New Jersey to learn more about the hair design and styling services we offer to men. We are conveniently located near Jackson, Freehold, Brick, Manalapan, Marlboro, Wall or any other surrounding towns in Monmouth County or Ocean County NJ. We look forward to seeing you!